It’s hard to travel with pets, but it’s even harder to leave them at home. If you’re taking a road trip this summer and want it to be fun for your whole family, then you’ll need to take these tips to heart. Is traveling with your pet the right thing to do? Is your dog suited to sustain the stress of travel? 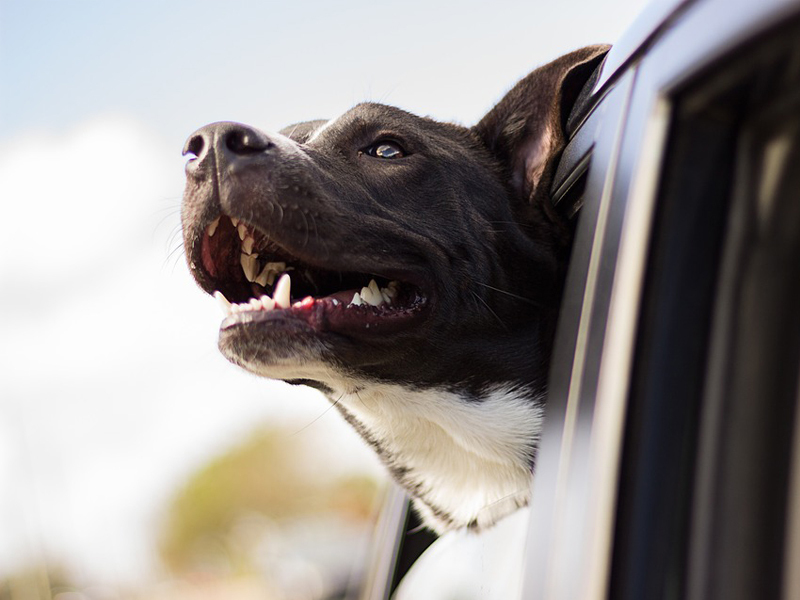 Will your pet be welcome at your final destination and any stops along the way? Will your dog join you on your adventures or spend his days at the hotel? If you decide to leave Fido behind, make sure to make arrangements for him well in advance of the trip. Have a trusted pet sitter come to your home, or ask your friends for referrals for the best local kennels. Don’t forget to do a dry run before you leave to make sure you pet is comfortable with the arrangements. Before you travel with pets, make sure all their vaccinations up to date. Some destinations (especially campgrounds) even require written documentation of these vaccines, especially rabies, so you need to make sure you have them handy. To be safe, when you travel with pets you should carry multiple copies of these documents and keep one in the glove box at all times. It’s also a good idea to research the regulations of each state you’ll be in during your trip. Some states require a Certificate of Veterinary Inspections, which is only issued when the dog is examined 10 days prior to your trip. If you plan to visit other countries, they may require even more documentation. Food? Check. Water? Check. These are the necessities for travel with pets, but what else is required? If your dog takes medications, ensure you have enough for the entire length of your trip. Maybe your dog has a special toy or leash that definitely needs to come along. It’s also important to consider how you will keep your dog safe in the car. Will he sleep in his crate the whole time, or do you have another way to restrain him? Thinking ahead and bringing the necessary supplies will greatly reduce both you and your dog’s stress levels on a long trip. These days, most of our dogs are micro-chipped, but unfortunately we still hear about dogs whose chip wasn’t scanned properly and never returned home. Sometimes owners don’t bother updating the chip’s information, which can also contribute to this problem. So, even if your dog has a chip, before you travel with pets it’s a good idea to ensure that your dog also has ID tags and that all his information is accurate. Tags are easily made at local pet stores; it’s a great idea to make an extra copy of them as well, just in case. If you are going on an extended vacation, consider creating a set of tags that features your temporary address to avoid confusion if your dog is lost. Are dogs allowed to stay free of charge? Is there a large, sometimes nonrefundable, cleaning deposit required as part of reservation process? Does my dog’s weight matter? This last question might seem strange, but some hotels consider the weight of dogs when determining their eligibility to stay. A few chains only allow dogs up to 25 pounds, while others set a limit of 70 pounds, regardless of the number of dogs you bring. After checking a hotel’s website, it’s always a good idea to call the specific location you will be visiting and ask, just to be sure. Remember: even if a hotel is pet-friendly, all it’s other guests might not be. Be respectful of the other guests and the facility’s grounds and rooms. If you’re like me, you have many photos of your dog on your phone, but you should always carry at least one printed photo with you when you travel with pets. This is just in case your phone dies, or you have no reception and need to identify your dog. It is also wise idea to look into the veterinary services available along your route and at your final destination. You might not be able to think clearly during an emergency, so while life is calm use your home computer to perform this search and carry the printed information with you. So there you have it: how to travel with pets. Do keep in mind that these suggestions mostly apply to car travel, and planes, trains, ferries and the like will have their own sets of rules and regulations to research.